Five members of the World Cup champion U.S. national women's soccer team have filed a complaint charging the U.S. Soccer Federation with wage discrimination. Julie Foudy and Abby Wambach join the discussion. 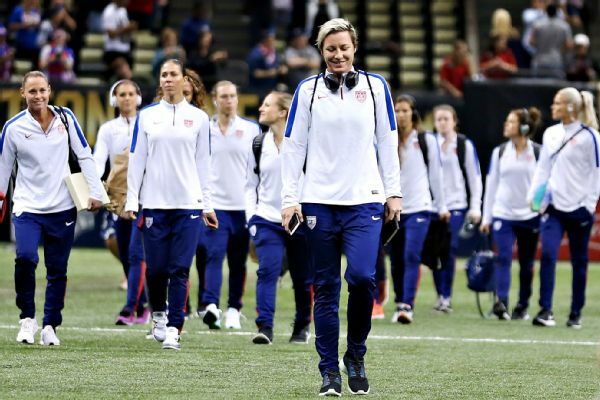 Kate Fagan details the wage-discrimination action filed against the U.S. Soccer Federation by five members of the U.S. women's national team seeking fair compensation. Jemele Hill weighs in on why she believes the United States women's national soccer team should consider a work stoppage in order to attain equal pay. Tim Howard shares the importance of the U.S. women's national team fighting for fair wages and just compensation. In this signature espnW column, Allison Glock sits down for a candid Q&A with remarkable people. The aim is to cover topics high and low, deep and less so, to present a fresh look at folks we think we know and meet some others we wish we'd known all along. Welcome to The Conversation. 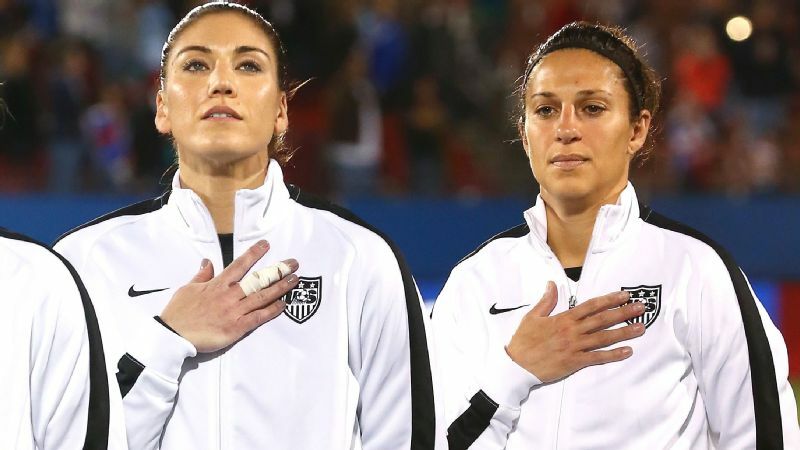 Who: U.S. women's national team players Alex Morgan, Becky Sauerbrunn, Carli Lloyd and Hope Solo. 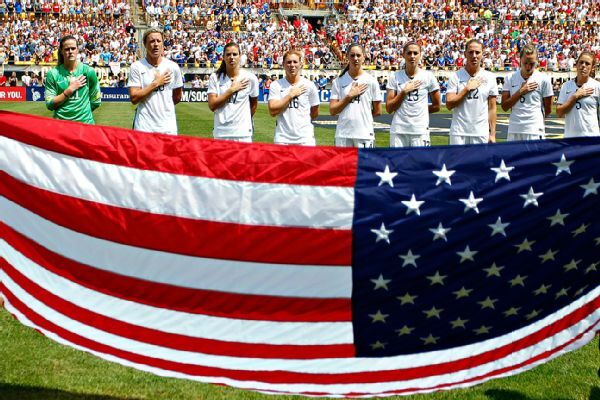 Allison Glock: The four of you, along with teammate Megan Rapinoe, just announced your filing of an action with the Equal Employment Opportunity Commission (EEOC) accusing the U.S. Soccer Federation of wage discrimination. What was last night like? 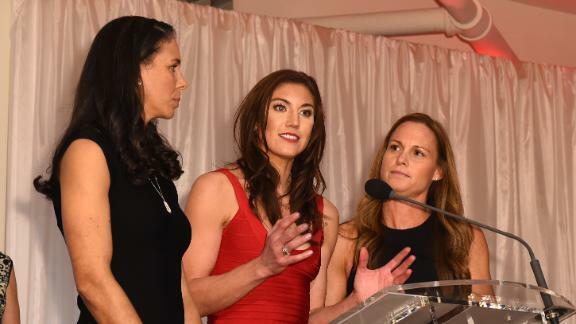 Hope Solo: I didn't sleep much. Five members of the USWNT have filed a complaint charging the U.S. Soccer Federation with wage discrimination, OTL delves into the ramifications. HS: I'm filled with anxiety. It's been hectic getting prepared for this morning, but I feel much better now that it's been filed. 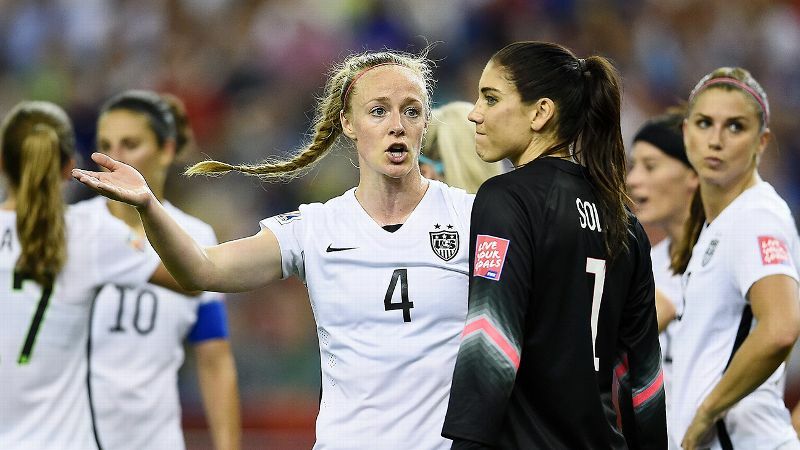 Becky Sauerbrunn: We feel we are fighting the right fight. We're on the right side of history here. So we have nothing to be too frightened about. But the whole idea of filing a complaint against your employer is a little ... daunting. AG: Why did you decide to do it now? BS: We kind of exhausted every other avenue. This was the next logical step for us. We were forced to do something that brings all this to light, that makes U.S. Soccer justify why they pay us less than the men. They have no justification anymore and we needed them to see that. Carli Lloyd: A report came out from U.S. Soccer listing the revenue and the finances, showing we brought in $16 million this past year. The facts are the facts. We've proven ourselves over the years with four Olympics, three World Cups. It's the right timing. AG: According to the federation's most recent annual report, it was projecting a loss for the combined national teams for fiscal year 2016, but as a result of the success of WNT, it's now projecting $17.7 million in profit. This disparity continues in 2017, where the women's team is expected to net $5 million in profit, whereas the men's team will be $1 million in the red. HS: We are the best in the world, have three World Cup championships, four Olympic championships and the men get paid more to just show up than we get paid to win major championships. AG: Your compensation is markedly less than the male players not just in salary, where you are paid almost four times less than the men, but in every regard, down to travel and per diems. HS: We tried to have meaningful conversations with U.S. Soccer. We tried to meet with them on numerous occasions. We tried to be logical. And we were continuously told the same thing -- that they'd allocated a certain amount of money for us and it was not going to go up. AG: How did that frustration tip into a legal action? 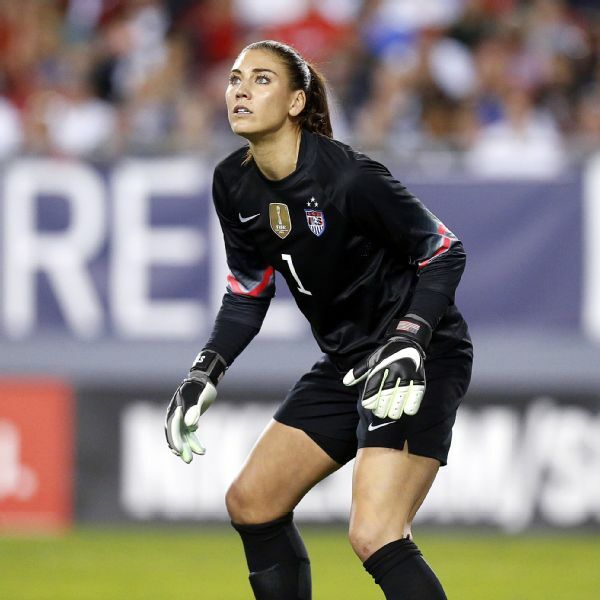 Alex Morgan: Bringing on a great team of lawyers with a great background in sports was really huge for us. That was the first step. That gave us direction in how to move forward in spearheading a fight against gender inequality within the U.S. Soccer Federation. Since then it has all come together really quickly. That said, what we filed in the complaint is nothing new. HS: And it didn't have to go down this route. That's the thing. We presented the facts to them first. Before we went public, before we filed a complaint. And they refused to see the facts. BS: Actually, the whole team agreed on the complaint. The five of us were voted on by the team to negotiate the [collective bargaining agreement] CBA, so it kind of made sense that we were the five listed on the complaint. AG: In early January you submitted a proposal for a new CBA that had "equal pay for equal work as its guiding principle." And U.S. Soccer responded by suing you. What are you hoping to achieve with this new complaint that you couldn't with the CBA? Hope Solo says the players have tried to have meaningful conversations with U.S. Soccer but were told they'the federation allocated a certain amount of money for the USWNT and it was not going to go up. AM: The dream is, of course, equality, but also to give more opportunities to younger girls. We've had generations of women in sports fighting for gender equality. This is continuing that fight. It's for the girls who are going to eventually take our spots on this team. Hopefully they won't have to fight as hard as we are. And hopefully we will contribute to a culture that pushes us toward true equality. AG: You make a good point about this being a larger, cultural issue. Fifty-one percent of the U.S population is female, and yet our concerns continue to be marginalized and defined as special interest even as we are the majority. HS: We were talking last night at dinner about how it has been almost part of our mindset, not just as athletes on this team, but as women, to accept less. We've been brainwashed as women to not stand up for equal pay with men. It's not just in sports, it's in every workforce for all women. We are trying to change the mindset. To shift the thinking. And that is something that is incredibly difficult to do. It's a fight that I don't think we're going to be able to stop fighting. AG: What kind of feedback have you received from other women? AM: Over the course of the last eight months, after winning the World Cup, we've had so many female athletes from other sports, as well as celebrities, actresses, women from all walks of life, come up to us at events. We've all felt that sense of community, especially around the wage gap. AG: Did those interactions motivate you to act? AM: I, personally, have been inspired by Reese Witherspoon, Jennifer Lawrence and Venus and Serena Williams. I've also seen Billie Jean King putting so much effort into women's soccer and tackling our gender inequality as she did with tennis. There has already been so much support for us. But I think through this complaint, we're going to see even more. BS: What motivates me the most is the injustice of it. There's no justification to not be paid the same as the men. We do everything the men do. We're marketable. We're popular. We are a revenue-generating team. There is nothing we don't do for this federation, so we should absolutely get paid the same as the men do. HS: I feel like it has been a long fight, always trying to prove my worth as a woman. I've experienced it throughout my life. But along the lines of what Becky was saying, U.S. Soccer can't justify their actions. So for me, this is about principle. And I believe in principle. A lot of times that doesn't make me very popular. But I've always stayed true to myself and this is a very important principle to me, women's equality. Alex Morgan hopes not only to achieve gender equality but to give more opportunities to younger girls. AM: Another thing, is that very few women have the platform we have to be heard. We've been given a stage to inspire young girls around the world and with that comes the responsibility to continue to push along gender equality and create more and better opportunities for women. We need to hold each other accountable. For me, I feel like this is our duty. AG: How challenging is it to continue to train and play well with all of this legal drama looming? HS: There is always something. Every World Cup, every Olympics. There's Zika in Brazil! We all have personal lives. We all have challenges, relationships. There is always something happening that you have to power through to make sure you present yourself the best way possible on the field. This action is no different. It is our responsibility as professional athletes to leave it behind when we step out onto the field. CL: And I don't think we have a hard time doing that. BS: No. We're 100 percent dedicated to the success of this team. The same as we were before the complaint went out. AG: What is the timeline for some legal resolution? HS: We know the investigation with the EEOC will take up to six months. We aren't naïve about how long this might take to resolve, but we are hopeful to hear something by then. AG: Is this action and getting results as important to you as your athletic record? HS: Absolutely for me it is. BS: This is the legacy we want to leave behind. Aside from being a successful team, we want to be an impactful team. We want to make a difference. AG: And to critics who say you should "feel lucky" to have what you already do? HS: For the 16 years I've been on the team, I've gotten the "go along, get along" message. BS: That's the entire mindset we need to battle. CL: That we as women should "appreciate" what we've been given, even if it's less than what we are worth. AM: I will say, from the people we are surrounded by, the coaching staff, people on the team environment, we don't get any negative comments. No one tells us to step down or be grateful for what we have. We keep a tight-knit group, and we focus on contributing on the field. Though, I'll admit, it isn't always easy. AG: You're putting yourself in a firing line of sorts. HS: Maybe. But I feel like it is important to shift the times. To change history. And I really feel like that is what we are doing here. As Becky said, we are on the right side of history. You look back. Women used to not be allowed to vote. There are so many things that are shocking in our past. And I think one day we will look back and think it is shocking that women didn't earn as much as men. We're going to look back and wonder, why did we value women so much less? BS: We're able to take on this battle because we have that mentality. We have never given up on anything. We fight through every adversity we have. So it shouldn't be a surprise that we are willing to fight this issue until we have exhausted every single avenue, and at least attempted every available option for us to make a difference. We're always going to keep fighting. That's what makes this team so great. HS: First stop, women's soccer. Next stop, the world! HS: Honestly though, you continue to fight when you believe strongly in something. And each and every one of us believes strongly in our cause. And that belief is what keeps us going every single day. We're not there yet, but eventually society will realize women are equal to men. AG: You are all incredibly inspiring. Have you considered running for office? HS: I don't think anyone would vote for us. Allison Glock has been a writer with ESPN for more than 15 years. The author of seven books, her work has appeared in The New Yorker, The New York Times, GQ, Esquire, Rolling Stone, Outside, Men's Journal and many other publications. She has also written and produced for television and is currently developing a series with A&E.